Keep meat, poultry, seafood, and eggs separate from all other foods in your grocery bags, in the refrigerator, and while prepping. Wash your hands, kitchen surfaces, utensils, and cutting boards frequently, especially after handling or preparing uncooked food and before touching or eating other foods. Wash produce but not eggs, meat, or poultry, which can spread harmful bacteria. Use the microwave, cold water, or the refrigerator method to defrost your frozen meat or poultry. Do not thaw or marinate these items on the counter, and be sure to cook them immediately after thawing. The bacteria that cause food poisoning multiply quickest in the ‘Danger Zone,’ which is between 40˚ and 140˚ Fahrenheit. In general, it’s best to keep hot food hot, and cold food cold. Use a food thermometer to check if meat is fully cooked and heated high enough to kill harmful bacteria. Cook turkey until it reaches 165° F.
The safest way to cook stuffing is outside of the turkey in a casserole dish. However, if you choose to cook stuffing inside the turkey, stuff the turkey just before cooking, and use a food thermometer to make sure the center of the stuffing reaches a minimum internal temperature of 165°F. 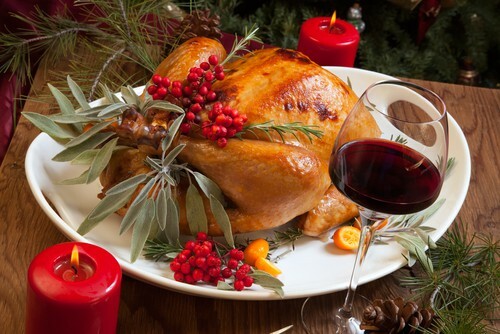 Remove the stuffing immediately after the turkey is finished cooking and place in a separate serving dish. Refrigerate leftovers promptly – within two hours – at 40° F or below to help reduce the risk of bacterial growth. Prevent cross-contamination by completely and securely covering foods in the refrigerator. Poison centers are available to provide expert, free, and confidential information and treatment advice 24-hours per day, seven days a week, year-round, including holidays. If you have any questions about safe food preparation, or if you or someone you know suspects food poisoning, call the Poison Help line at 1(800) 222-1222.